Today is the D-day. And yesterday , I received my last alert from the Federal Government of Nigeria. 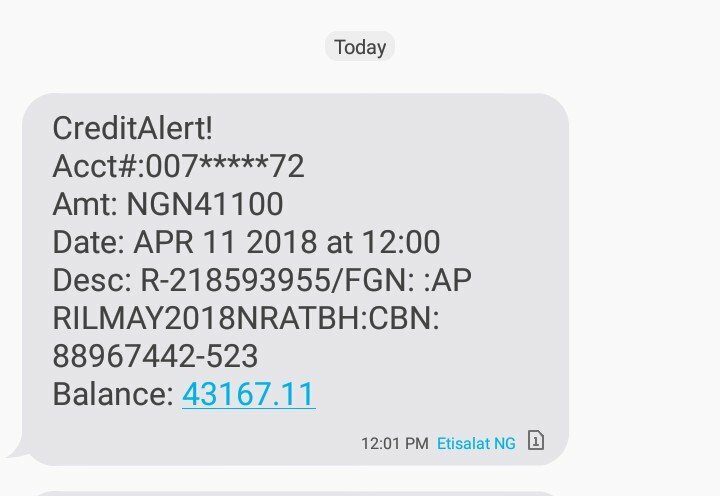 A total sum of #41,100 comprising allawee for both April and May. My people, when this alert came in, I was not excited about it, just as news of my passing out only makes me reflect. No excitement whatever. People that passed out since, it this how it was doing you? Or am I just abnormal? Anyways, as I was saying, I stared hard at my phone when this alert came in. It dawned on me, that this is the last time I’ll be receiving money for allawee. Like, I’m actually really done serving! As in, I’m now completely on my own. I’m now fully in the favour labour market. The realization, though fleeting, was deep and somewhat paralysing. And Miracle (my CDS Vice President) didn’t make things any better. She went about asking people what their next plans are. I was the first one she asked. “All I need right now is a laptop,” I said looking beyond her to nothing in particular. I could see by the expression on her face that she did not understand. I didn’t want to explain but Miracle is not one to give up so easily. “I don’t understand, you want to be a typist?” she asked already laughing. “Will it bring money?” she teased, batting her lashes like a cute puppy. And then I just looked. Because I honestly do not know if blogging is my calling because, my people, the ministry is not moving! This 41k is a blessing to me. I intend to buy a laptop with it. If my blog is to grow, I need it. But the money is not enough and I have no idea where the rest is coming from. Las las, I go dey alright. On a lighter note, I fixed my nails yesterday in preparation for today. Lol… It is news because I normally don’t do that. I wanted to fix lashes too but I felt like it would be too much, so no. I’ll be leaving Karu for Lafia by 7am this morning. Hopefully we’ll be there by 10am. Don’t worry, I’m pretty sure you’ll be fine. Congrats on finishing though. I also nominated you for an award. You can check it on my blog. You’ll be alright! I get how it is when you need something but then the money you have is not enough. I hope you can get a laptop donated to your ministry without having to even pay sef. Either way, I’m sure you’ll be fine. How come you feel discouraged about blogging? Is that you in the picture? Fine ghel! Lmao but I wish you all the best on the next phase of your life – it’s okay to not have it figured out, it’s all one step at a time shebi? That is not me in the picture, sha. Got the picture from nairaland as I stated at the end of the post. Thank you so much, Amaka. I hope your prayer for me comes to pass. Congratulations darling, many who started this journey of service couldn’t complete it for one reason or the other, but you did! Don’t worry you’ll do just fine and you won’t even be able to explain it. PS: is that you in the picture 😄? That is NOT me in the picture o.
Lol… I like that ‘was-a-corper’. Again congrats you’re now a madam! Eketi’s ministry is moving to the permanent site already because it’s her calling. I’ve always wanted a spot in her classes but I’m not sure I’m cut out for her skits. No. Thanks Deshi, (I might soon stop trying and just allow auto-correct call you sushi Kawai 😂). Congratulations Gurl…seriously you are not abnormal because I was not even stoked when I finished. I did not even take a picture because…well, I can. Welcome to the labour market, just know life is hard and the one we are living is a full put of beans. Super congratulations! The awry feeling is normal. It will pass and then it will come back again. Welcome to the labor market sugar ! I soooo know this feeling! When I finished service last year, I did take some pictures and try to act excited but I was quite blank and happy and scared all at the same time. Blogging is really cool.. Like your page is so much fun girl! Still, its a question only you can answer for yourself… There may be other awesome shades of you no one may know of at the moment that the world would be blessed (and would pay) to have… So take your time to figure out what you’d want to do… and mbok its absolutely okay to not have it figured out yet… No one really does. You’ll be fine. I’m holding 👆 n to these, Ozioma. Thank you. Congratulations dear. Las las you and your bank account go dey alright.